Marvin Elementary School staff members pose for a photograph with members of the Waxahachie ISD board of trustees at their recent meeting. The school was honored for its national recognition with the Capturing Kids’ Hearts program. 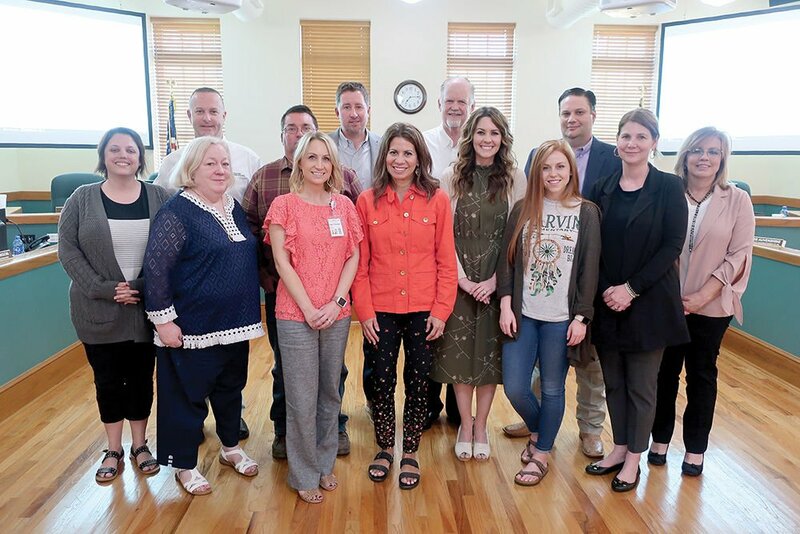 Clift Elementary School staff members pose for a photograph with members of the Waxahachie ISD board of trustees at their recent meeting. The school was honored for its national recognition with the Capturing Kids’ Hearts program. Two Waxahachie ISD campuses have been named Capturing Kids’ Hearts National Showcase Schools for the 2018-2019 school year. The honor was extended by the Flippen Group in recognition of the work done at Clift Elementary and Marvin Elementary in creating a climate and culture conducive to learning through use of the organization’s Capturing Kids’ Hearts program. The two campuses were further recognized by the WISD board of trustees during its regular meeting Monday night. Shelle Blaylock, assistant superintendent of leadership and academics, noted that the two elementaries are each in their second year of implementing Capturing Kids’ Hearts, which is an initiative that serves to transform a campus into an emotionally safe and relationally connected place for students, staff and parents. “There has been diligence and purpose (in the implementation),” she said, noting that taking part in a program such as Capturing Kids’ Hearts is a campus decision based upon its students’ needs. It is not a given that a participating campus can then be named a national showcase, Blaylock said, noting there is an annual application and criteria that must be met to receive the honor. “They have to reapply each year and they have to continue to meet the criteria,” she said, noting that Clift and Marvin will now serve as an example for other schools looking to successfully adopt the Capturing Kids’ Hearts program. Clift principal Christi Kubin and Marvin principal Christy Bailey, along with their staffs, were recognized by the WISD board for for their efforts. 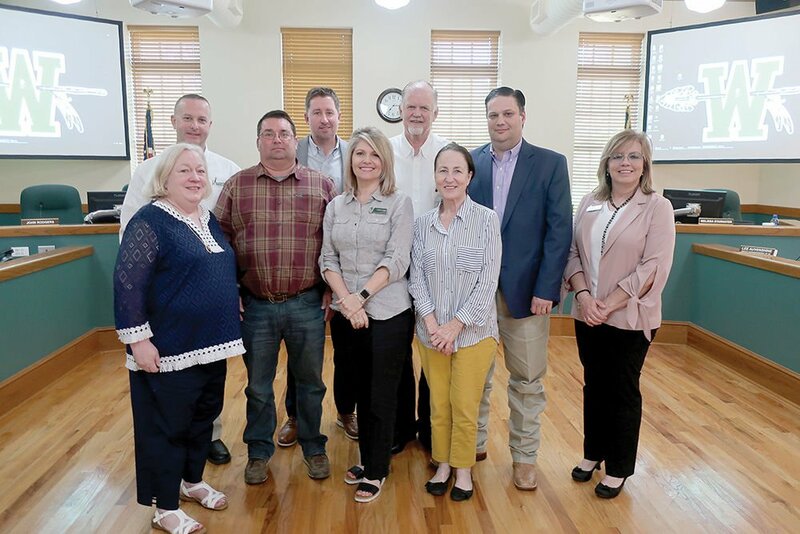 Two other WISD campuses have also joined the Capturing Kids’ Hearts program, with Howard Junior High School and Northside Elementary each completing their first year this school year, Blaylock said. Through Capturing Kids’ Hearts, teachers and staff learn processes to increase students’ connectedness with their peers and campus adults and also how to create a classroom environment where students are excited to enter and learn every day. As a result of implementing Capturing Kids’ Hearts, both the Clift and Marvin campuses have reported a decrease in behavior incidents while witnessing the impact of a student-centered culture. “The kids not only understand the process but they own it as their own,” Blaylock said. Since 1990, campuses across the country have experienced improvements with Capturing Kids’ Hearts tools and processes by creating socio-emotional safety conducive to learning, according to the Flippen Group, which reports that openness replaces defensiveness while judging and feelings of being judged are replaced with acceptance and connectedness to the school. Through the Capturing Kids’ Hearts National Showcase Schools awards, the Flippen Group recognizes and celebrates those among its participating campuses that go the extra mile each day in building a good environment. • data demonstrating a significant improvement in attendance, discipline, climate/culture and academics. A Flippen group team visited each nominated campus to gather additional quantitative and qualitative data, and to interview students, teachers, administrators and parents, with a matrix of key measurements used to gather information during the campus walk-through. An additional survey was conducted to collect feedback regarding the perceived climate and culture of the campus and its conduciveness to learning. The selection team then reviewed all accumulated data and selected the campuses to receive a Capturing Kids’ Hearts National Showcase Schools award.